The exhibition NEIN.GAG re-contextualises ​a work of Constant Dullaart's that has recently become a popular internet meme "this DVD guy“. Constant Dullaart has been exploring the internet as a medium since the early 2000s. With works such as Youtube as a sculpture (2009) – a sculptural rendition of the "loading" animation on YouTube – the audience is implicated in the piece through commenting, reinterpreting and reposting it on various social platforms. The exhibition NEIN.GAG re-contextualizes ​his work DVD guy: Humans Saver (2010) within the panke.gallery space. 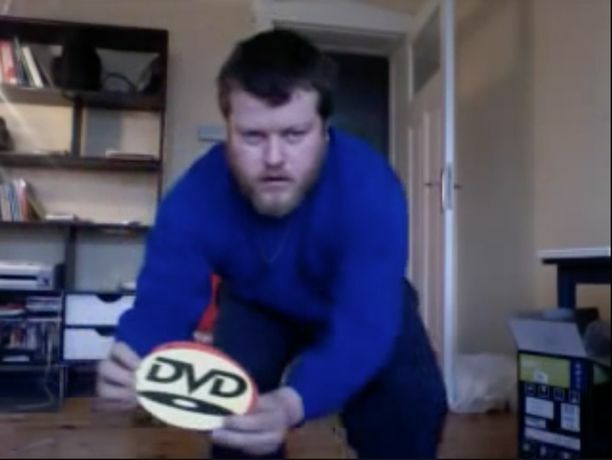 This work – a webcam performance – bridges the gap between two different forms of media, the internet and the DVD, and the reaction of the public has recently culminated in the creation of a popular internet meme "this DVD guy".